I know companies understand that they need to have a brand, but many miss the mark on creating a cohesive brand identity. Although many may see this as ‘fluff’, creating a strong brand identity can be a complicated process that’s difficult to master. As I tell many of my clients, brand identity is not just a logo; it’s the entire visual language that your company uses to communicate with its audience. It’s the art of portraying the right message and making a lasting, first impression. Review your current brand and your competition: Think about how your brand is being perceived in the marketplace and whether the message you’re delivering is clearly understood and reaching your target audience. It’s not enough to just review your brand; you need to understand what you’re up against. Have you done your market research? If not, now is the time. Audit your audience: Know your audience! Build a brand around what they want (not what youwant). It’s a competitive world out there. If your customers don’t find what they’re looking for from you, they will find it from someone else. Choose your theme: Choose your theme wisely. A well-conceived theme creates a powerful and effective communication platform which will deliver a higher ROI. A theme is compelling and engaging because it’s able to communicate your brand identity more effectively. It takes brand identity to a whole new level. Develop a consistent colour palette: Your colour palette is typically defined by the colours in your logo and is the foundation of your visual brand identity. The colours don’t have to be identical to those in your logo but should complement them. Very important – your colour palette must work well with your website and printed material. Don’t go overboard with fonts: There are hundreds of fonts to choose from but don’t go overboard using too many fonts that may look creative but are difficult to read. Less is more. You can use a different font for headlines than for body text, but the font must be easy to read, and be consistent across your website and print materials. Use custom design elements: Looking off-the-shelf isn’t going to help you stand out. Custom design elements can be a huge asset to your brand identity. A professional graphic designer can create your logo and various elements of your website. The images don’t have to be the same throughout your website and print materials but all of the visuals should contribute to a consistent look and feel. Use a consistent tone of voice: You can’t tell your story without words. It’s important to give a great deal of thought to what style of writing will be consistent with the image that you want to portray in the marketplace and mesh well with your imagery. Consistency is key to a successful brand identity. A professional writer will be able to understand your voice and produce work consistent with it. Every company needs a cohesive brand identity to compete in the marketplace but many miss the mark because they attempt it on their own. You need a professional marketing agency with strategists, graphic designers and professional writers. CreativeWorks Marketing has over 20 years of experience helping companies like yours build cohesive brand identities. Give us a call today and maximize your return on investment. In our last blog we discussed Market Research – Your Roadmap for Success. Today I’m going to delve into competitive analysis and more specifically, using mystery shopping to conduct competitive research. This blog will explain the importance of mystery shopping as a key approach to learning about how your business can be differentiated and why it’s equally important to hire a professional to conduct mystery shopping research. Do you know your competition? How are they different from you? What are they doing that you’re not? How are they perceived in the marketplace? More than any other marketing approach, I have found that conducting a competitive analysis for our clients has proven time and time again to be so crucial to the success of a marketing strategy. Mystery shopping is a tried and true research method used to conduct competitive research. Mystery shopping is a research methodology that uses trained, professional mystery shoppers (not your mother, your aunt or your junior marketing assistant) acting as prospective customers to ascertain particular aspects of your competitors’ businesses. While posing as customers, mystery shoppers perform a series of assigned tasks designed to elicit a particular type of behaviour or information. They observe, measure and report back on their findings. Mystery shoppers may employ several techniques to achieve their goals. What is their brand experience like? How is their online experience? How effective is their customer service? Once you understand your competitors you can make informed business decisions on how to differentiate your company. And you can use mystery shoppers to see how your company fares against the competition using the same set of criteria. It’s very important to use a professional agency when conducting mystery shopping research. There is a strategy to competitive research. Based on the information you’re trying to elicit, you pre-assign tasks to the mystery shoppers. They must be professional or they will be detected, wasting whatever time and money you’ve invested in the effort. The information they return needs to be analyzed and a marketing plan created on the basis of those results. Marketing Resolutions To Keep for 2015! Check out the competition: See where your competition is spending their money, you could learn something! Are they focusing on branding themselves? What keywords do they use on their website? Knowing this information will inform your marketing strategy and will help find ways to help you stick out from your competition. Explore your social platforms: Find what platform works best for you and engages your target audience the most. If your subject matter is image heavy, don’t be disappointed if you’re struggling with success on Twitter – it may not be where your best audience is. Try Instagram instead! Invest in measurement: Whether you’re looking to launch a national campaign, book an ad in a magazine, or start a blog, make sure that wherever you choose to spend your marketing dollars on has the best ROI. Increase your curiosity: Never stop trying and testing new campaigns or messaging! You will not only keep your content fresh, but over time you will refine messages to your current target markets, and find new ones. Digital advertising is one of the most flexible mediums for messaging and testing new content. Get out there! 2014 wouldn’t have been the kind of year it was for CreativeWorks without my incredible clients! Thank you. Your businesses inspire me and I look forward to working with you in 2015. To those of you following this blog or engaging in my discussions on LinkedIn who are not my clients, thank you for your interest and engagement. In 2015, I will continue to bring you hands-on, thought-provoking insights and case studies based on my personal experiences as the owner of a Canadian marketing agency. On behalf of all of us at CreativeWorks Marketing, I wish you and your family the very best for the holidays and New Year! Are there any topics you’d like me to write about in 2015? Please share your questions and comments below. With the last of the fall leaves falling from our trees, this last quarter is one of the best times to review your marketing plan with a tried and true business tool, the SWOT analysis. But let’s focus on a marketing SWOT, which is a great way to review your marketing strengths, weaknesses, opportunities and threats. It provides insights that can guide you in revisiting your marketing strategy, giving your company a stronger edge in the marketplace. I have outlined below a few tips on conducting a marketing SWOT analysis, which will enable you to quickly see any missing gaps and revise your resources or plan as needed. How do I get started with a Marketing SWOT? Outline or summarize what you have planned for your organization: strategic direction, target audience, what you are known for, sales figures, internal and external resources, and a marketing budget breakdown including web, campaigns, online and media spends. Here you should make note of significant advertising spends that you may have that your competitors do not, brand name recognition, and a proven, loyal customer base. Also consider your proven brand value as it relates to your customer (engagement of your audience). A company could suffer because it has poor brand recognition or customers regard the company’s products or services as unreliable or overpriced. Weaknesses are important in a SWOT because they suggest how best to position a company against a rival that is stronger overall. Here you should illustrate any move your company could make to enhance its position. You might want to list extensive cash resources and financing as a chance for your company to quickly grow market share by spending more money on advertising and promotion. You could also consider any recent expansions or new services/products that could provide a strong future opportunity. These are similar to weaknesses, but show how your company is vulnerable to developments in the marketplace. For example, an established company that has always relied on traditional advertising in its marketing could face threats from new, entrepreneurial companies determined to build market share through social networking. Once completed, you can review your current strategy against the SWOT and see if there are any gaps that you can address. You can also use the SWOT to help determine how best to use the company’s marketing budget given other factors in the marketplace and the competitive landscape. Have you ever heard of a marketing SWOT? If so, when was the last time you conducted a one? How did it help you strengthen your marketing strategy? If not, do you see the value in doing a marketing SWOT for your company? I look forward to hearing your stories in the comments below. It seems like SEO is big business these days – it’s the “buzzword” de jour! With more and more SEO consultants, online SEO experts, SEO packages, SEO promises, and SEO professionals popping up every day, I find myself and many of my clients bombarded with the pointed message: “Your business will die without proper SEO” (I am paraphrasing of course). With many web companies, online providers and marketing companies all providing SEO, how are you to know which one is offering the right SEO for you? Should you buy that SEO package online or use the consultant from that SEO Company everyone is talking about? I certainly understand all the SEO confusion that exists in the marketplace. SEO by its shear nature is continuously evolving which is why there seems to be a mystery around what it is exactly. Let’s demystify it: SEO, or Search Engine Optimization, plays an important role in your customer’s research and buying cycle. It attracts potential buyers to your website through critical and relevant keywords and phrases ranked high in search engines where searchers are already looking for information about them. SEO is about being where your customers are, and directing them towards solutions you offer them. SEO is so important, in fact I would say it is absolutely essential to helping you grow your online business, but like other marketing tactics, SEO needs to be part of your marketing strategy. A good marketing strategy will provide an indication of which marketing tactics should specifically target your audience. The tactics will complement SEO and in combination, strengthen and reinforce each element to grow your business exponentially. To be clear, SEO alone (i.e. without brand awareness, and a strategy) cannot help you reach your highest marketing potential. How much you should invest in SEO, what type, and who implements, are great questions for a discussion to have with your trusted marketing agency or advisor. Although they may not be SEO experts, they should be able to help you understand why you need it, what type of investment you might be looking at, and point you in the direction of a professional SEO specialist. 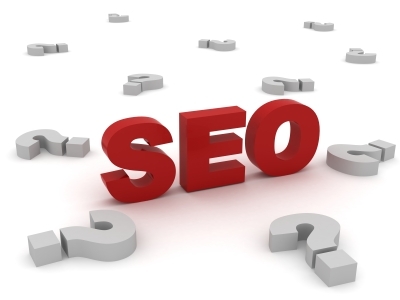 Does your marketing agency provide you with SEO services? What type of successes have you had with your SEO? How long did it take for you to see results? What investment have you made? I look forward to your comments below. Would you play football without a strategy? As I watched my son’s football game this weekend, I was struck with how important it is to have a solid strategy to win the game. I know many would debate whether the game is won by good defense or a strong offensive line, but these are mere executables – the game, very few can deny, is won on the best game strategy. Imagine a game with no strategy, with players not knowing their position or their objective. I can’t imagine that game being very successful. Growing your company requires having a winning marketing strategy, yet surprisingly not all companies have one. Instead, many have a list of tactics or “plays” they should have and then execute on them. Often through sheer luck, the “play” or marketing tactic is successful in the short term, but over the long term of a game or of a business quarter, the tactics run thin and the result is a loss. To win the season, coaches will set a strategy, which will be tweaked depending upon the battle on the field. Similarly in business, if you want long-term gains, then creating a strategy is the only way to go. Your marketing strategy should be to influence both existing and prospective customers that your business offers something unique or special – differentiating you from the crowd. If you fail to persuade people that your service is unique or offers “additional value”, then your customers’ buying decision may simply come down to price alone. A focused marketing strategy depends on continually explaining and emphasizing how and why your business is not only reliable and represents good value, but is also different (read better) from the competition in subtle and genuine ways. 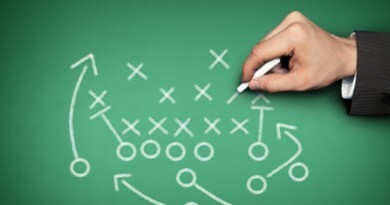 With a strategy in place, you could have a year like the Patriots did in Super Bowl XXXVIII! In business, your marketing strategy will lead you to create and implement marketing campaigns and tactics that stay focused on the needs of the target customer, with an emphasis on continuously communicating the benefits of your services over those available from the competition. Do I hear touchdown in your future? What do you think? Do you have a professionally written marketing strategy that you follow in your business? If not, what’s stopping you from creating one? I look forward to your comments below.